There were 17 participants: Gail Beukes, Stephen Cousins, Dawie de Swardt, Richard Dobson, Graham Fiford, Dennis Gerrans, Graham Grieve, Doug Harebottle, James McFarlane, Rick Nuttall, Dieter Oschadleus, Brian Phelps, Thinus Rautenbach, Lily-Arison Rene de Roland, Dominic Rollinson, Keith Keith Stephenson, and Arnia van Vuuren. 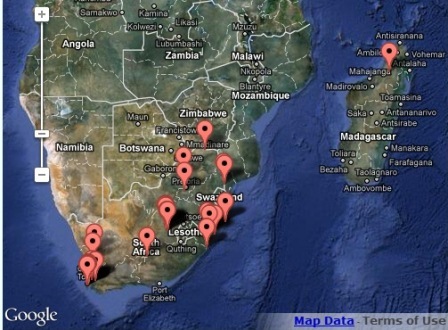 Records were submitted from South Africa and Madagascar (see Map). To see all the records go here. This event formed one of the events in the ADU 20th anniversary celebrations. The PHOWN totals of the winter Digital Biodiversity Week may be viewed here.